All of the below was examined in September 2010. We also looked for new information in early January 2011. CARE's Press Releases page allows a search by date. The press releases from January 2010 on (when the Haiti earthquake struck) are operational, but we opted to read only the "featured" press releases noted below. Google search for "CARE Haiti" turns up CARE International's Haiti page but this page does not appear to have substantive information on the disaster response. It also turns up CareForHaiti.org which offers a link to find out about CARE's work in Haiti. The link goes to Donate to provide hope, dignity and economic opportunity. Searching CARE's site for "Haiti" turns up Haiti earthquake: six months later. The "Press" tab on that page appears to have a comprehensive list of relevant links: 3- and 6-month reports, 6 newsletters on Haiti, 15 relevant press releases (all of which we read) as well as media coverage links that we did not read. From the CARE USA front page, we examined What We Do (led to Emergency Relief & Rehabilitation and CARE International's Resource Center); Special Reports; CARE's Work (led to Haiti); Annual Report. On CARE International (found through the links above) we explored Where We Work, the Emergency page (leading to Our Emergency Team); Who We Are, leading to CARE Strategic Plan 2007-2012. We also consulted our 2009 blog post on CARE Evaluations and the Chronicle of Philanthropy's survey results published at How Charities Are Helping Haiti: How Much They Raised and Spent. We find that CARE gives a substantially more detailed picture of its activities than many of the other organizations we've reviewed in the category of disaster relief. However, its funding breakdown is extremely general, even by the standards of these organizations (many of which provide only highly general funding breakdowns). CARE. CareForHaiti.org. http://www.careforhaiti.org/ (accessed September 9, 2010). Archived by WebCite® at http://www.webcitation.org/5slgNYoie. CARE International. 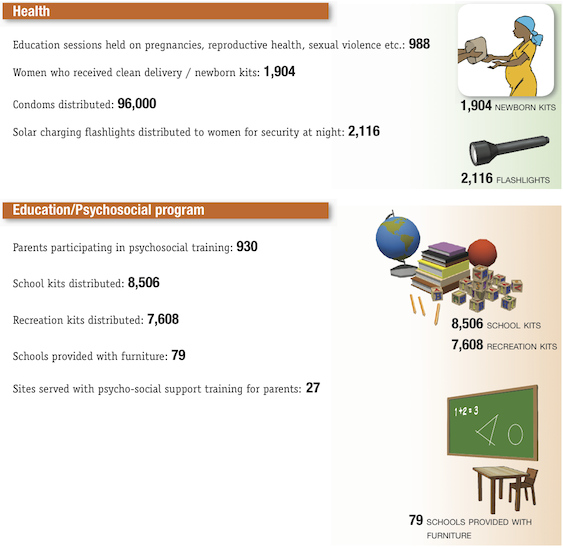 CARE International - An overview (2009). CARE International. CI Secretariat Annual Report 2007-2008. CARE International. Emergency. http://www.care-international.org/Emergency/ (accessed September 9, 2010). Archived by WebCite® at http://www.webcitation.org/5slgccW9F. CARE International. Haiti: CARE earthquake relief and recovery (January-November 2010) (PDF). CARE International. Haiti earthquake: CARE finances (January-October 2010) (PDF). CARE International. Haiti quake response strategy document (PDF). CARE International. Homepage. http://www.care-international.org/ (accessed January 11, 2011). Archived by WebCite® at http://www.webcitation.org/5vezSUQKC. CARE International. InterAgency assessment report. CARE International. Our Emergency Team. http://www.care-international.org/Emergency-Team/ (accessed September 9, 2010). Archived by WebCite® at http://www.webcitation.org/5slgbwKPL. CARE International. Strategic plan (2007-2012) (PDF). CARE International. Resource Center: Hotspots. http://www.care-international.org/Hotspots/View-category.html (accessed September 9, 2010). Archived by WebCite® at http://www.webcitation.org/5slgcb0Hy. CARE International. Who We Are. http://www.care-international.org/About-Care/ (accessed September 9, 2010). Archived by WebCite® at http://www.webcitation.org/5slgc4Nqi. CARE USA. CARE Distributes Food, Water and Supplies to Haiti's Hardest Hit. http://www.care.org/newsroom/articles/2010/01/haiti-distribution-food-wa... (accessed September 9, 2010). Archived by WebCite® at http://www.webcitation.org/5smGdiQrL. CARE USA. CARE Haiti Newsletter - April 29 2010. CARE USA. CARE Haiti Newsletter - March 12 2010. CARE USA. CARE Haiti Newsletter - March 19 2010. CARE USA. CARE Haiti Newsletter - March 26 2010. CARE USA. CARE Haiti Newsletter - May 05 2010. CARE USA. CARE Haiti Newsletter - May 21 2010. CARE USA. Signs of Change (PDF; annual report for 2009). CARE USA. Special Reports. http://www.care.org/features/specialreports.asp (accessed September 9, 2010). Archived by WebCite® at http://www.webcitation.org/5slgOo5mB. CARE USA. The way forward: Haiti three months after the earthquake. Chronicle of Philanthropy. American Charities Raise &dollar;709-Million for Haiti Relief, Chronicle Tally Finds. http://philanthropy.com/article/American-Charities-Raise/64193/ (accessed September 17, 2010). Archived by WebCite® at http://www.webcitation.org/5solB4OOD. "CARE USA had raised &dollar;10.3-million as of Monday." Chronicle of Philanthropy, "A Roundup of Haiti Fund Raising as of January 29." "CARE USA had raised &dollar;11.3-million as of Tuesday." Chronicle of Philanthropy, "Haiti Donations Exceed &dollar;644-Million, as of February 3." "CARE USA had raised &dollar;12-million as of February 17." Chronicle of Philanthropy, "American Charities Raise &dollar;774-Million for Haiti Relief, Chronicle Tally Finds." Total”© revenue ”©from ”©fundraising ”©appeals: Worldwide:”© &dollar;34.4”© million. USA:”© &dollar;15.5 ”©million”© (included”© in”© above ”©total)." CARE USA, "CARE Haiti Newsletter - April 29 2010," Pg 3. "Expenditures ”©for ”©initial ”©response – ”©cash”© only: ... Actual: ”©&dollar;5.75 ”©million." CARE USA, "CARE Haiti Newsletter - April 29 2010," Pg 3. "Value”© of ”©contributions ”©in ”©kind ”©distributed (not ”©included”© in ”©spending ”©listed ”©above): Donated”© through”© CARE ”©USA: &dollar;1.0”© million”©. Negotiated”© locally ”©in ”©Haiti:&dollar;1.3”©million." CARE USA, "CARE Haiti Newsletter - April 29 2010," Pg 3. "CARE USA had raised approximately &dollar;17.75-million as of May 7." Chronicle of Philanthropy, "&dollar;1.1-Billion Donated for Haiti Relief: Updated Tally (May 11)." "CARE...Amount raised: &dollar;18,200,000; &dollar;36,500,000 worldwide. Amount spent: &dollar;9,600,000 worldwide." Chronicle of Philanthropy, "How Charities Are Helping Haiti: How Much They Raised and Spent." *All figures through October and rounded to the nearest 100,000 in US &dollar;." 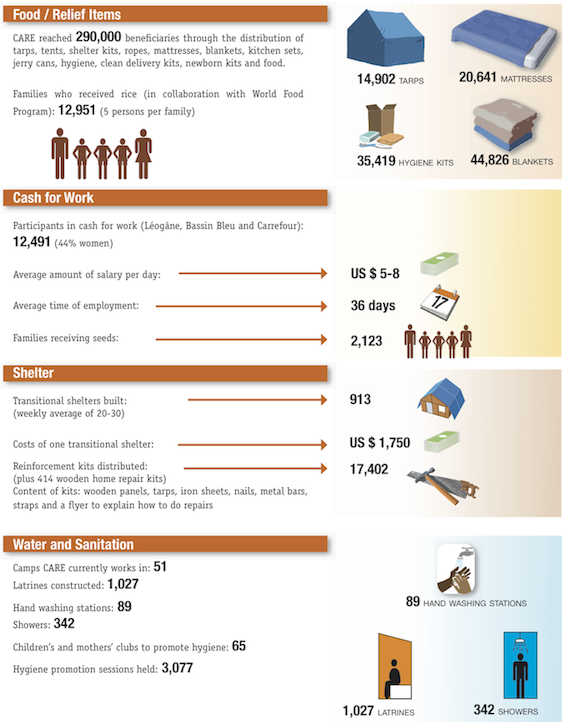 CARE International, "Haiti Earthquake: CARE Finances (January-October 2010)." CARE International, "Haiti earthquake: CARE finances (January-October 2010)." CARE USA, "Search CARE's Work." Example: "This watershed management project aims to create sustainable and replicable models of strengthening municipal governance that is responsive to the needs of their citizens and fulfill their mandate of integrated management, restoration and economic development in a participatory manner. The project will support municipalities and communities development capacity, systems and resources to take the ownership of their own development agenda. Revitalizing municipalities in this manner will lead to the project goal of improved quality of life and economic well being of men, women, boys and girls in the 13 municipalities of the semi- and high lands of Nicaragua. To achieve the main goal, the project will strengthen the capacity of municipalities and communities to: plan, manage and restore their watersheds; manage funds and resources in an efficient and transparent manner; provide effective services to communities to manage water supply and sanitation systems; protect and restore environmentally sensitive areas; and access natural resources in a sustainable manner that enhances economic well being of all residents in a gender sensitive manner." CARE USA, "PIMCHAS - Integrated Project for Watershed Management." See CARE USA, "CARE's Work" for links to all countries. See CARE USA, "Nicaragua Country Profile" for an example. See CARE USA, "What Do We Do?" for links to all program areas. See CARE USA, "What we do: Education" for an example. CARE USA, "Signs of Change" (2009 annual report).